I’d be lying if I told you I didn’t have a soft spot for clothing, especially when it’s hand made from natural fibres…linen, cotton and wool. It has a lovely rawness to it compared to all those fast fashion ‘made-in-china’ clothes stuffed onto racks at any big box retailer. And yes, I know natural textiles are hard on the ol’ wallet but a $10 t-shirt also comes at a cost that’s often less visible; in human and environmental terms. Midani’s path to making clothes is a meandering one that spans decades beginning in the 90’s when when she designed costumes for theatre and opera. Photography and set design also shaped that path and in 2014 she launched her first clothing collection. You can find out more about this talented maker on her website here or follow her on Instagram here. It’s a sunny 5 degrees outside today so no wonder I’m drawn to the warm softness of artist and teacher Miriam Verbeek’s jewellery and objects. Wool, for life and death, is felted along with fibre and fabric at her home studio using traditional techniques of water, soap and friction to create beautiful, comforting tactile forms. 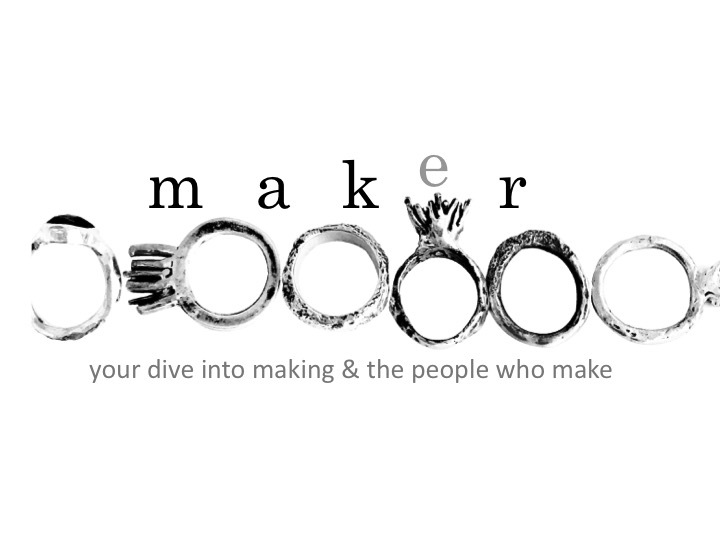 You can find out more about this maker on her website here. I bought a pair jeans recently that I can safely say we’re dyed using industrial strength chemicals, some of which are considered poisonous, hormone disruptive and carcinogenic. So I want to travel down a lesser known road of makers today into the world of ecoprinting (an ecologically sustainable contact print that transfers leaf dyes to cloth, clay, wood, stone or paper ; now widely adopted by makers in almost every country”. Welcome to the “whirled” as she calls it, of India Flint. “By the grace of the broody hen, whose eggs had been laid in a rain-dampened nest of sun-toasted eucalyptus windfalls, and bore evidence of leaf prints after three days warmed by her body in that damp environment; I decided to bundle eucalyptus leaves in silk cloth, and discovered pure magic…washfast leaf prints of incredible detail, no mordant required (in case you’re wondering as I was, a mordant is a substance added to a dye that fixes the dye to the fabric). P.S. I highly recommend following her on instagram @prophet_of_bloom. Her images and words are magic. When I say ‘knitting’ what comes to your mind? For me it conjures up images of women knitting stubbly woolen socks, sweaters and hats, of snow drifts and long dark winters, years before the invention of department stores, acrylic yarns and internet shopping. ‘Born from the human need to protect ourselves from the elements, knitting quickly became a common thread throughout Europe and the Middle East early in the common era. To me, it represents the human need, artistry in its variations, and a universal language. Accumulation of singularly hand knit material worked en mass, proves great satisfaction for me. Fantastical and surreal landscapes emerge through wistful color combinations describing visceral feelings of the season, change, and uncertainty. The tended and wild materializes to describe the vastness and flatness of my beloved landscape but one that proves universal to us all’. Check out her website here or follow her on Instagram here. I don’t consider myself a textile person thanks to my grade 8 Home Ec. teacher, Mrs. Talerico. I wasn’t good at matching up pattern pieces on the sewing machine and was too anxious about getting to the end product to fully concentrate on the process, so grade 8 and two or 3 pillow covers later I moved on. This isn’t to say that I don’t appreciate clothing and furniture fabric, it’s that I don’t know a lot about it. In fact, there’s a whole universe of knowledge about textile if you look, it’s development throughout human history, it’s terminology and it’s ever-changing technical advancements, not to forget it’s effects on the planet (here). And from her website…’I work with different textures and methods to create sculptural shapes and designs. I am particularly interested in making three dimensional fabrics using traditional methods, weaving, knitting, plaiting and knotting as well as more untraditional methods by folding and pressing fabric. My ideas develop and change over different projects and are reactions to images seen and research built up in my sketchbooks. Pieces are often driven by the process or technique I am using, but I am also inspired by patterns and structures in nature as well as man-made buildings and constructions. I also use museums as a great source of information and learning which informs my work’.